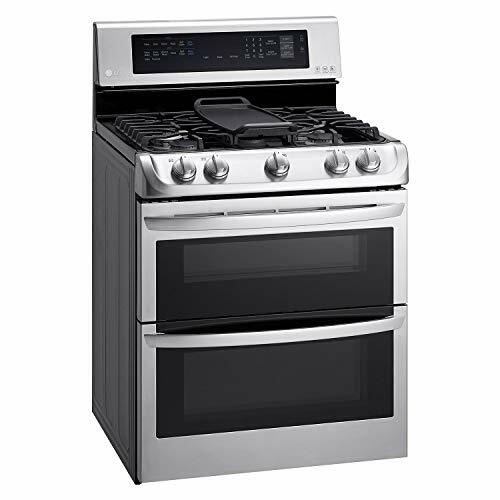 Update: The LG LDG3036ST double oven gas range has been discontinued. A similar updated model is the 30" LG LDG4315ST which has slightly more oven capacity. This review will be updated with the LDG4315ST features and specifications. The main objective of the unit is to give you a cooking experience that is faster and cleaner than the rest. It features five burners and double ovens (like the GE Cafe cgs990setss) allowing you to cook more than one meal at a time. Its design is well laid out and user interface is exceptionally easy-to-use with large control knobs and simple interface. The blocky and angular design at 29 7/8" wide x 47 5/16" (overall dimensions including back guard) is appealing with its stainless exterior. The controls of the ovens are incorporated on its back guard and are easily accessible. The unit has four regular burners and one griddle burner in the center. All of them can be controlled by sturdy dials that are featured on the front side of the range. For easy cooking, the appliance features two ovens- upper and lower that divide the total 6.9 Cu. Ft. capacity of this unit. The capacity of the upper oven is 2.6 Cu. Ft. and that of the lower oven is 4.3 Cu. Ft. for cooking larger meals. In comparison, the LG LDG3036ST only had 6.1 Cu. Ft. in total. The capacity of the lower oven allows you to place a large roaster pan of about 16 × 13 × 5 inches easily. Unfortunately, this gas range does not feature an infra-red broiler. If it did, we imagine that the price would increase significantly. It features a bake and broil element. Are there smells when using this oven? When starting the range, a small amount of gas does not burn off because it has already risen up past the point of being ignited. This is nothing to worry about and is very common with gas ranges. If you notice a gas smell after you’ve been cooking for a while, then you may have a leak which will require a professional repair person immediately. The unique self-cleaning ability, LG EasyClean®, lets you press a button rather than spray chemicals inside. Because of this feature, you can concentrate more on feeding your family rather than cleaning the oven all the time. The LG LDG4315ST offers impressive versatility and flexibility. Having dual ovens is a bakers dream! You can bake cookies and cake at the same time or a pot roast in one, with desert in another. Well-encrypted controls are extremely easy to decipher. Large grates might not fit in your sink for cleaning. The built-in steam cleaning feature could be improved. Silver burners can be difficult to clean once stained. Gas burners make for responsive cooking. If this your first gas range, take it easy on the temperature because it gets hot a lot faster compared to an electric stove. The self-cleaning features are a nice touch, especially for those of us who dread spraying and getting an arm workout trying to get the nasty bits out.